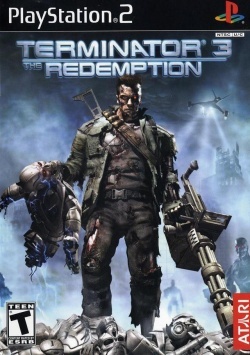 Game description: Step into the shoes of the Terminator in a postapocalyptic universe. With machines and vehicles straight from the Terminator films, you'll engage enemies in ground and air combat. As humanity's most powerful weapon, you can perform a variety of actions--including ripping out opposing Terminators' power cells and using them as high-powered explosive devices, using dismantled Endoskeletons as shields, and smashing opponents to pieces with metal-bending hand-to-hand moves. Fight for the cause through three distinct timelines across massive worlds. 1.5.0-20180327153300 GSdx OpenGL Hardware, Native, High Blending Accuracy, Bilinear (PS2) Texture Filtering. Playable with minor issues. Runs at full speed. This page was last edited on 18 June 2018, at 19:21.